I checked out of the swanky Sanur hotel and I heard a voice shout my name. It was Made (pronounced Mah-day). He was sitting in the lobby and stubbed out his cigarette and smiled at me. Something about his smile was so comforting. He was the kind of character that within minutes of his company I felt like I had known him my whole life, very familiar with kind eyes. He dressed casually in a t-shirt and jeans but still had an air of being presentable. He appeared to be in his 40s but I later learned he is only in his early 30s – perhaps life had trodden him down a little. I had met him prior to today as he is the Nephew of an old Balinese friend and he offered reliable transport. Today was different; today Made’s eyes were full of concern. It turned out his Father had a stroke and he needed to get him to the hospital urgently. I asked him why he didn’t cancel picking me up as I would have been happy to get a taxi. He looked stunned and quickly responded, “Nooo!” I also asked him why his father could not get an ambulance. Made told me that ambulances are not sent for ‘trivial’ things like strokes! Being an ambulance clinician myself in England, this really stunned me. A stroke is serious and is treated as a time critical incident in England, yet here in this Balinese paradise, over-swarmed by western tourists to the point that you could be in Sydney, an ambulance was saved for something more serious!! This highlighted even more how the healthcare service in England is abused by so many!! But also, how in the developing world, the idea of turning down paid work to take your urgently sick parent to hospital is impossible. My heart broke a little for Made. I arrived back to the cosy hotel in Kuta that I have stayed in many times before over the past 7 years. The local shop owners recognise me. One in particular, a young lady called Putu always recognised me, even when I return pasty and white some years later. “Lou!” She shouts as I walk past her shop. Putu was always smiling, come rain or shine. She invited me into the back of her shop where a small child was screaming on a small dirty mattress. I joined Putu on the mattress and she explained to me that Olivia (her daughter; one of four!) was upset because their family friend had left to return to Australia. Putu went on to tell me how blessed and happy she was. I looked around the small cramped room that she lived in with a small mattress to share with four small children and I felt a pang of guilt. Putu was grateful and happy to have her shop and a roof over their heads. I couldn’t help but retrace the thoughts I have had over the past 2 years and all the difficulties I have faced which one would consider ‘first world problems’ and yet here was Putu who had next to nothing but she was so happy and always smiling. It really put things into perspective for me. Soon after, I left Putu’s shop feeling a little dazed and strolled through the humid heat around the buzzing lanes of Kuta. I found a tailor shop filled with hard working local men working on sewing machines. I am a keen sewist and asked if I could watch them for a while. Within no time they had me working on a machine, for fun of course. However, the thick humid heat swelled in the room with a small dusty fan which may as well have not been there. Whilst I struggled to concentrate and work in that heat with sweat pouring from my entire body, the employees mostly had their shirts off and a cigarette hanging loosely from their lips, casually working away, cutting fabric, ironing, overlocking. I admired them so much. Naturally being a western white woman, lots of tourists walked past and giggled at the sight of me working in this shop filled with Indonesian men, but I didn’t mind. I actually got a glimpse of an insight into what life is like working in poverty-stricken Asia and I noticed that they don’t take ‘days off’, they will work 80 hours a week without a complaint if it pays the bills. This again gave me perspective on my life. Yes, my job is challenging, but I DO have days off and down time to put my feet up. I doubt very many do in Indonesia and similar countries. I stayed in the shop for several hours and found a new sympathy for the local businesses “harassing” tourists for business. Seeing things from the other side softened my heart. I had been reading a book about he Bali bombings (The Paradise Guesthouse, Ellen Sussman – highly recommended) and felt an overpowering need to visit the memorial site. The book had made the incident feel so real to me, all those who lost their lives. I was pulled to the location of the bombings and stood for a while, staring at the plaque listing the full names of all those who lost their lives on that tragic day. For some reason, I couldn’t walk away until I had read the full names of all 202 people who passed away and tried to imagine a little something about their lives, be it local Indonesians or Portuguese solo travellers. The rain started beating down, harsher than a power shower and I slinked off into the shelter of a local pub for a beer. What a day it had been! A real eye opener. It’s days like these that keep my desire to travel burning forever. I later found out that Made’s father was treated for his stroke and is on the road to recovery, much to my happiness and relief! Whilst some people’s idea of happiness is to get a mortgage and pay off their debts, enslaved to a full time job, this is the idea of hell to others. In an ideal world we should be travelling constantly. We were not designed to buy a house and never leave it. The world is impossibly large for a reason, to explore it. So if, like me, you cannot afford to travel constantly, so have the home and a full time job and waste hours dreaming about travel… How often should we get away? When I used to work in travel, a month would never pass that I wasn’t on a plane, and I loved it! Nowadays I am lucky if I get away more than once a year. And I don’t even have kids or a mortgage. So I decided to travel with work, set up a new life across the country and start a fresh. It’s great because there is a whole new part of the world to explore and it’s fresh and exciting all the time. Although, nothing quite beats getting a flight and travelling a new continent.. There are People Still Unaccounted for in this World. In developed countries, busy commuting to college or work, it’s easy to think this is normality for the entire world. We all moan about our governments and healthcare systems etc etc, but we hardly ever stop to appreciate the fact that we have them. When travelling to the outback, farthest depths of developing countries, it’s only then when it hits you, hard, that there are people, families, children, who are ‘unknown’. They are not a statistic, they do not have a passport, they do not have a bank account. They live in the same clothes day in, day out, perhaps in a tent in the desert with nothing around for miles but their family. I was fortunate enough to sit with such a family and drink tea with them in the Wadi Rum Desert in Jordan some years back. There was not a trace of electricity or television. They had simple cushions and blankets under a basic tent to provide shelter from the punishing heat. Two young boys played up in the rocks while their parents sat with us and talked. They were generous and offered what they could and more importantly, they seemed happy. Imagine a life where education and employment doesn’t exist. Only skills for survival.. The youngest of the two boys was coughing, a lot. I work in healthcare so I could tell he had a pretty bad lower airway infection. This family, with their simple means of survival, had no easy access to antibiotics. Even a shower. In the developed world we lose our minds because our network provider ‘crashes’ for an hour, disabling access to making phone calls. But this family, they had never seen an iPad before. The Top 6 Best and Worst Bits about Travel. 1. Experience. By this I mean soaking in new sights, doing something new and challenging outside of your comfort zone; this is the best. 2. Meeting new people. We make friends constantly when we travel, and they are usually like minded people on our wavelength and they are the best! 3. Culture and dining. Seeing how other people get by day-to-day is truly enriching. Eating the food and flavours they create is a wonderful part of travel. Each nation has a signature dish and its great to try new things. 4. Climate. Often where we travel to will have a drastically different climate to home. Be it snow or sunshine, it’s great to experience a landscape with a different season. Skiing down a mountain, or laying on a beach topping up that tan… Bliss! 5. Activities. Travel always pushes us to our limits and a large percentage of people who travel are more likely to take part in something whilst away than they would at home. In turn, this makes us happier and builds self esteem. 6. Escape. By far one of the best bits about travel is escaping our own versions of reality. We imagine what it would be like to live in this land that is by any stretch, miles better than our own boring lives. 1. Exhaustion. Like it or not, travelling can be tiresome. Even once the hours, if not days of trekking through airports and surviving long haul flights is done, we want to cram our days with so much excitement that sometimes we forget to get enough rest at night and end up feeling like we need a holiday once the trip is over. 2. Creature comforts. Yes it’s great to ‘get away from it all’, but after a while we start to miss the simple things like our own bed, a kitchen to prepare the finer things in life (such as a cup of tea and some toast!) and the sofa. Even people or pets are comforts we miss when away! 3. Mosquitos. Or any ‘foreign creepy crawly’ that we have never seen before and therefore are not certain if it will kill us just by looking directly at us. 4. TD. This is an abbreviation for travellers diarrhoea. Anyone who travels to other continents often will be familiar with this one. It’s often caused by undercooked street food or even tiny particles of faeces in your food. Yum. 5. Jet lag. Especially on an around the world ticket, you are forever trying to get your body climatised and adjusted to your new home. Chances are, by the time you sync up with your zone, it’s time to leave. One of the first thing that surprises me about New York is the size of it. Coming from London which is over 1,500 km2 and homes just over 8.5 million people, New York City is a measly (in comparison) 789 km2 and houses more residents at around 8.7 million. That’s 11,000 people per km2. Not accounting for the hoardes of tourists that flock to the city on the daily…!! You can actually rarely see the sky due to the vast amount of skyscrapers. 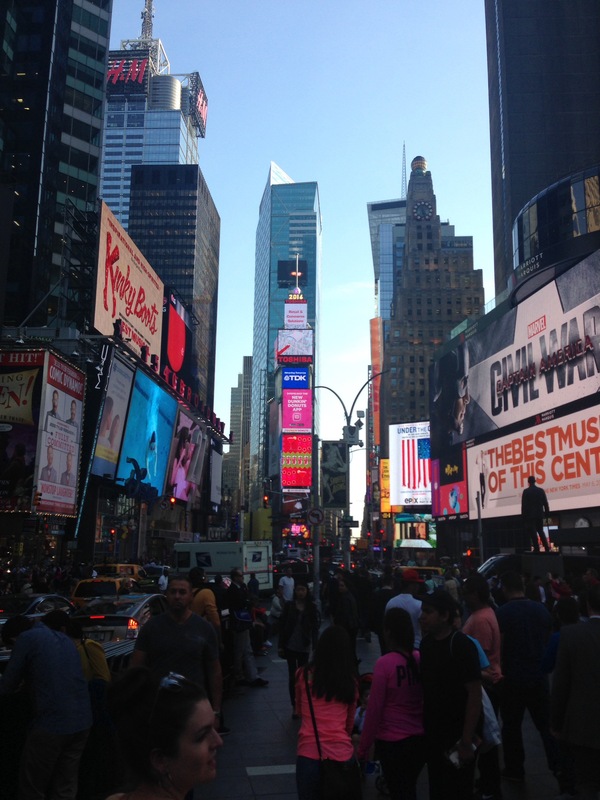 Whatever time of day or night it is, if you are near Times Square, daylight cannot be detected. At 10pm the skies are brighter than a summers afternoon. You can’t smoke anywhere in the city! All bars and restaurants have made their outside areas (and within 25 ft) totally non smoking. You are not permitted to smoke in the parks. So if you’re a smoker, try to find a stoop or quiet sidewalk. This is not a bad thing! The subway is gross. It’s cheaper than Londons equivalent – The Underground (which it actually copied the idea from), but you can tell. It’s quick and convenient, though. Getting a taxi has become increasingly difficult during the summer months. One day, on fifth avenue in a desperate rush, I was actually reduced to tears and was bargaining with a New Yorker who was trying to get home so I could make it 15 blocks to an important meeting. If you can get the subway, do it! If you’re in the world’s shittiest mood, or ecstatically delirious, New York City just works. There is no inbetween. 7 Things British Holidaymakers ALWAYS do..
1. Despite forking out a fortune for the trip, it is guaranteed the minute the plane doors open, Brits will immediately commence commenting and moaning about the heat. 2. Become incredibly tight fisted and stingey. Somewhere in the process of exhanging foreign rates into the good old British pound, we decide that everything is ‘too expensive.’ Even if in reality, it costs 5p. British are very quick to sync into what is ‘local value’ and categorically refuse to be ripped off!!! 3. Get burnt. This is usually on the last day of the trip, through fear of not seeing rays of sunlight for months to come. 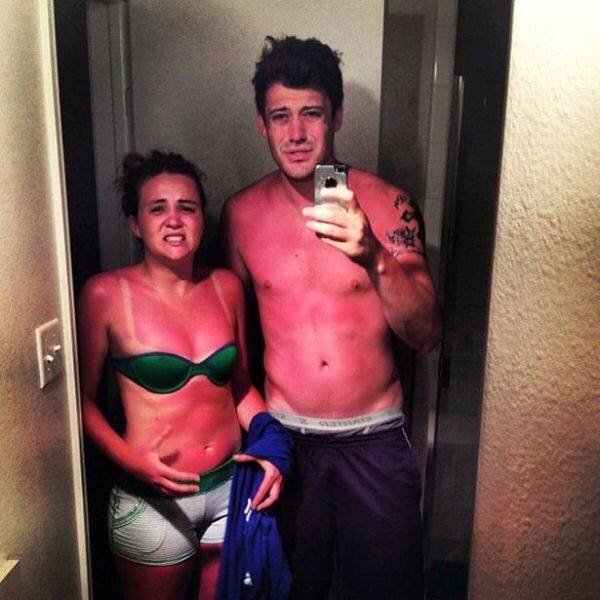 Naturally, we then complain about being burnt. 4. There is always an English man who rocks into the sauna and loudly shares his wit by shouting ‘it’s like a bloody sauna in here!’ We’ve heard it..
5. Gets flip-flop toe injuries. Us Brits don’t often get to wear flip-flops and the 8 hours a day of walking around in them always gives a nasty gash between big toe and second toe. Ouch! 6. Complain. If the flight is delayed, the hotel isn’t perfect, hell even if the curtains are a different shade than advertised, there will be hell to pay! 7. Love other Brits. It is a fact that the only time a Briton is pleased to see another Briton is when on holiday. It becomes a miraculous stroke of fate that took both families to the same resort…We become friends. We cry when they leave and promise to keep in touch. We don’t keep that promise.